In the face of severe attacks on public sector unions headed our way this summer with a decision by the U.S. Supreme Court expected in the Janus v AFSCME case as early as June - a case that will, if ruled in favor of the plaintiff, strip unions of the right to collect "Fair Share Fees" from non-dues paying members even as those members benefit from the union contract and representation, as an attempt to starve unions of funding - New York Governor Andrew Cuomo signed new legislation last week to help unions stand up against these kinds of attacks. 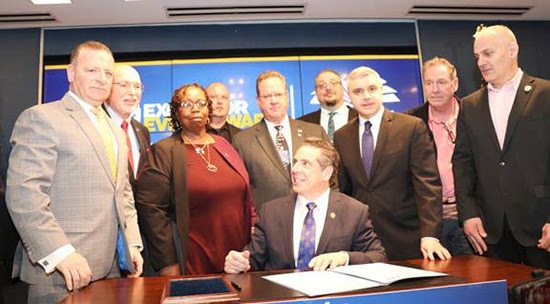 Local 1180 President Gloria Middleton was on hand along with a dozen other 1180 members - all public sector workers, who will feel the most immediate impact of a negative outcome in the Janus case - to be a part of the signing. The new law aims to increase access to and protect union membership, while also setting up safeguards against attempts by the federal government to weaken unions. "This action sends a clear message to the rest of the nation," said Governor Cuomo. "We will not let this federal administration silence New York's working class, we will support every voice in every community and in every industry, and we will do everything in our power to protect the right to achieve the American Dream."